Can you say a "happy accident" (courtesy of IMG to keep a deal alive). 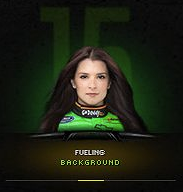 I like Danica, but if someone of Juan Montoya status says balancing BOTH taxi cabs & Indycars is TOO DIFFICULT for even him.... Come on girl, get real. Very wiered, wonder where the Chevy photo came from?